Set comes with Silver Liberty Dollar (Silver), Liberty Half Dollar (Clad). All other coins are Clad Kennedy Half, Washington quarter, FDR Dime, Jefferson Nickel and Lincoln Penny. 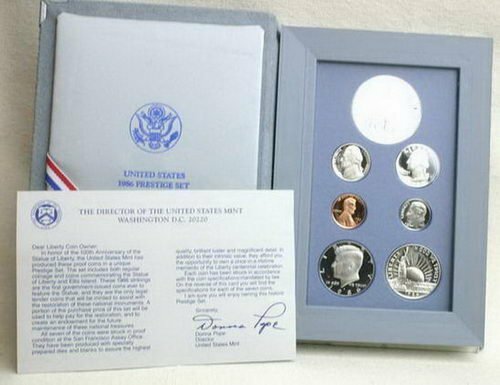 All coins comes in US mint packaging and COA. Proof sets have been preowned and may have slight blemishes. We make sure they are close to the photos. These sets were issued each year with each proof coin made as well as the special commmemorative silver dollar for the given year. Each set has a total of 6 coins each and come housed in an impressive box and holder that allows you to see both sides of the coins. Sets come with all of their original paperwork and packaging. 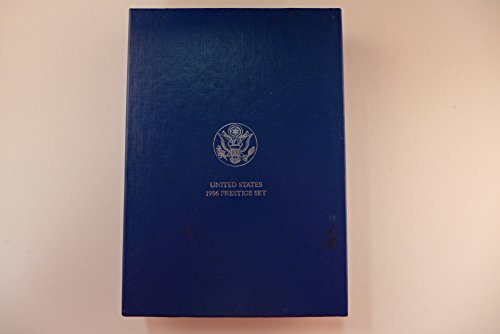 United States Mint Prestige Proof Sets consist of some of the rarest and most highly sought after proof sets in the history of the U.S. Mint. The 1986 Prestige Proof Set contains 7 coins.First sold in 1983, Prestige Sets consist of proof version coins of the five U.S. circulating coins, along with commemoratives from the year of issue. As they are made specifically for collectors, Prestige Sets are highly valued for their beauty and rarity. Each Prestige Set comes with a certificate of authenticity and is encased in a stunning holder. This beautiful album opens like a book to handsomely display the eye-catching allure of each coin.This set includes:* (1) Lincoln cent* (1) Jefferson nickel* (1) Roosevelt dime* (1) Washington quarter* (1) Kennedy half-dollar* (1) Half-dollar Statue of Liberty Commemorative* (1) Statue of Liberty Commemorative Silver Dollar struck in 90% silver. All coins were struck at the San Francisco Mint.This "vintage" Proof set has been previously owned. It is in "like new" condition and comes in its full original US Mint packaging. 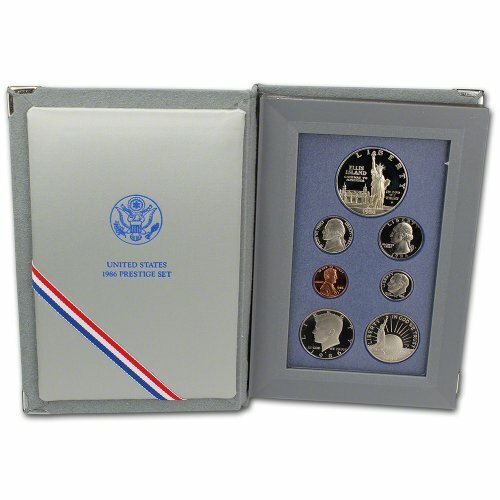 This 7 piece U.S. Mint Coin Prestige Set comes in it's original velvet box and Certificate Of Authenticity. It comes with the We the People Constitution Proof Coin.Modern U.S. proof coins are often treated with chemicals to make certain parts of the design take on a frosted appearance, and the fields taking on a mirror finish. Several other methods have been used in the past to achieve this effect, including sand blasting the dies, and matte proofs. Proof coins of the early 1800s even appear to be scratched, but it was part of the production process. These US Commemorative Prestige sets make excellent gifts, from Anniversaries, Weddings, to Birthdays, Graduations or just a nice thoughtful gesture. 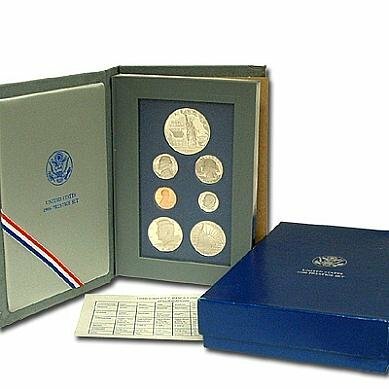 Contains the 1986 Statue of Liberty 90% US Silver Dollar & the 1986 Statue of Liberty Half Dollar plus the Traditional 5 pieces 1986 Proof Set. Includes all the original packaging and the COA. Note* The silver Dollar alone has .7736 Oz. of pure silver. 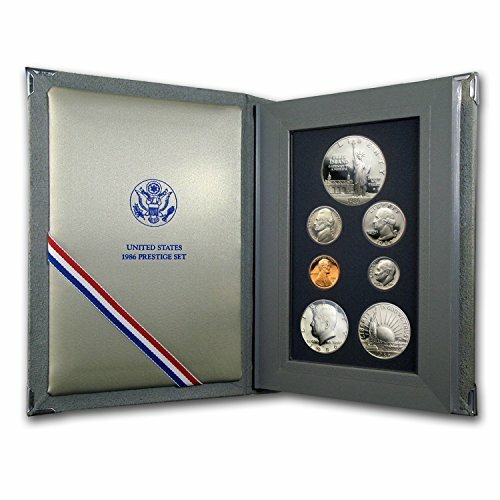 This superb U.S. Mint Prestige Proof Set is your best choice for beauty, low mintage, and high quality. This 7-coin 1986-S set includes the standard cent through the half dollar, plus one-year-only commemoratives. Includes the Statue of Liberty half dollar and silver dollar ... Low mintage - exceptional quality... Mirrorlike surfaces and frosty design details... Official U.S. Mint case with certificate of authenticity ... Choice Proof condition... 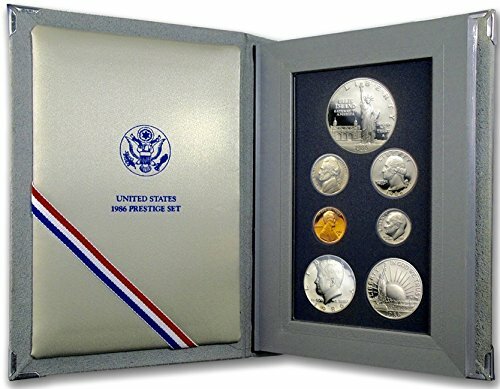 Struck in very limited quantities just for collectors, this 1986-S Prestige Proof Set honors a special event in U.S. history. Copyright © Wholesalion.com 2019 - The Best Prices On 1986 Prestige Proof Online.